Would You Rather is a fantastic party game for tween sleepover parties. But it can be hard for kids to think up their own questions “on the spot” so sometimes the game comes to an end pretty quickly! 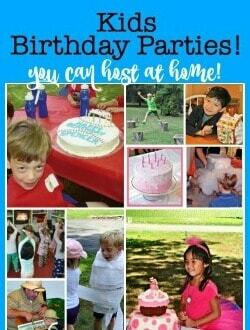 To keep things moving along and make it a whole lot of fun for the party guests- my kids and I came up with these 50 Would You Rather Questions that is now one of our favorite party games for kids! We recently celebrated my youngest daughter's 10th birthday with a sleepover party. The birthday girl and her guests enjoyed a “glamping experience” in our own backyard- complete with festive lighting and sleeping in our giant family tent. And we themed the entire party around one of our favorite cooking shows (you can check out the full details of our backyard Cutthroat Kitchen Party here). I wanted to give the girls something fun to do in the tent in the evening after the main party activities were over, and while I initially proposed our Truth or Dare game for tweens, my daughter had her own idea- she wanted to come up with our own “Would You Rather” questions instead! So we did! Since these questions are specifically written for a tween party- we stayed away from posing questions about crushes (not every tween has them!) and from anything that might make someone feel embarrassed or left out. They are meant to get the kids talking and hopefully share a few laughs as well! I printed all of the Would You Rather questions on my home printer, and using my paper cutter This is an affiliate link: MomOf6 earns a commission if you purchase, at no additional cost to you. , cut the questions into individual strips, folded them in half, and placed them inside of a glass jar (that is actually a recycled pasta sauce jar). To pretty it up, I added a label and a ribbon! 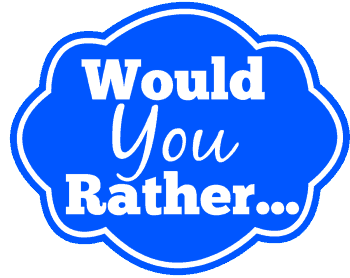 Ready to Download the Would You Rather Printables? Would your tween love to play this party game? HI, I signed up, but did not receive the email for the Would You Rather questions. Can you please email them to me? Thank you so much. We are having a sleepover for my daughter’s 10th birthday and would love to use the would you rather and the truth or dare printable questions but I am unable to download/print them! I just filled in my name and email and it said that I needed to confirm something on the email but I don’t see any emails? Abby- I looked in my email system and it shows that your confirmation email was “bounced” which means that either your email inbox is full or is no longer working in general. Please try subscribing with a different email address. Hello. I subscribe but can’t download the truth and dare .please help. 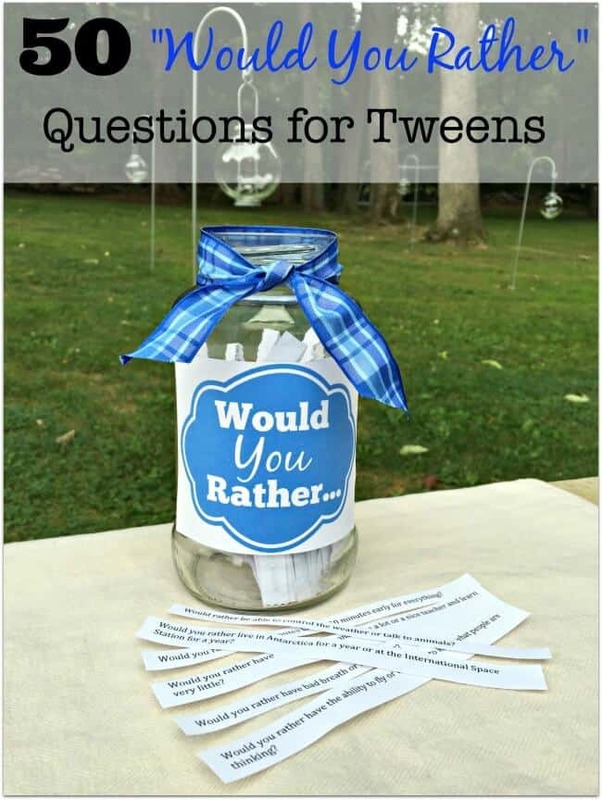 I cannot access your free printable 50 would you rather questions for tweens. Can you email them to me like you did to Jenna? I’ve tried 2 different browsers and I can’t get the would you rather or truth or dare printable link to work. Any ideas? I’d love to have these! Hi Jenna- I had a problem with my optins over the weekend. They work now- but I am also emailing them to you! Your daughter had a great idea! Very cool! Thanks for sharing at Dishing It & Digging It! We enjoy seeing great ideas each week! This is a wonderful activity for tweens! I will definitely be sharing this with friends and pinning, too. Thanks for linking up your post at the #HomeMattersParty this week. Such a fun game, we used to play on long car journeys. When the kids were little they would have very random combinations, then as they got older we moved to more gross ones that usually involved Zombie apocalypses or loosing limbs! These are much better, what a good idea to have them all ready in advance. This is awesome! I’m hosting a ladies’ fellowship at church tomorrow, and I’m using some of your questions (the ones that aren’t about school etc) to play this fun game. Thank you so much. I’ll be sure and give them a heads up to your website. That’s a fun game. I might try to change it up a little for an adult party game I’m having. This is great! Definitely using for our next get together of youth! My kids are constantly asking me the would you rather questions. They always pick gross stuff! Thanks for the link. Maybe I can get them motivated to ask me not gross questions! My girls love this game! Glad to have some new ones to put in the mix! Hosting a group of 11-12 year olds (my daughter’s volleyball team) on an early out day for an overnight. Thank you, thank you, thank you! My daughter is so excited to do this. We printed both Would you rather….and Truth or Dare. We have been looking at team building type stuff as well as a “spa day”.